First, let’s look at the financing of practice acquisitions. Over the course of the last year there has been a noticeable shift in lending trends, especially with practices worth less than £1 million. Indeed, because the market for banks wishing to finance these transactions has narrowed a little, and there is now less competition, borrowing has increased significantly for lendees that fall into this price bracket. This could prove to be a problem in the coming year for a number of prospective buyers. By stark contrast, the market for practices above £1 million (for regular acquirers) is wider than it was last year, with Lloyds Banks and Wesleyan particularly active. As for micro-consolidators, a number of banks have struggled to maintain the low rates they had once been able to offer, resulting in a mass movement away from these lenders to a more attractive option. Offering terms at sub 2 per cent, HSBC has been a particularly popular alternative for this demographic. Perhaps the busiest lender, however, is the bank of mum and dad thanks to their cheap rates! This has continued to fuel the practice sales market, especially for first time buyers in the NHS sector. In regards to goodwill, the results indicate that the market remains strong but relatively static. For us, the average sale value as a percentage of turnover increased ever so slightly from 140.54 per cent to 142.11 per cent, though this is somewhat balanced out by the average practice sale value, which has decreased marginally to £881,430. However, as the average turnover in the results this year was £593,525, which was lower than last year’s survey where the figure was in excess of £600,000, we feel that this figure is irrelevant. 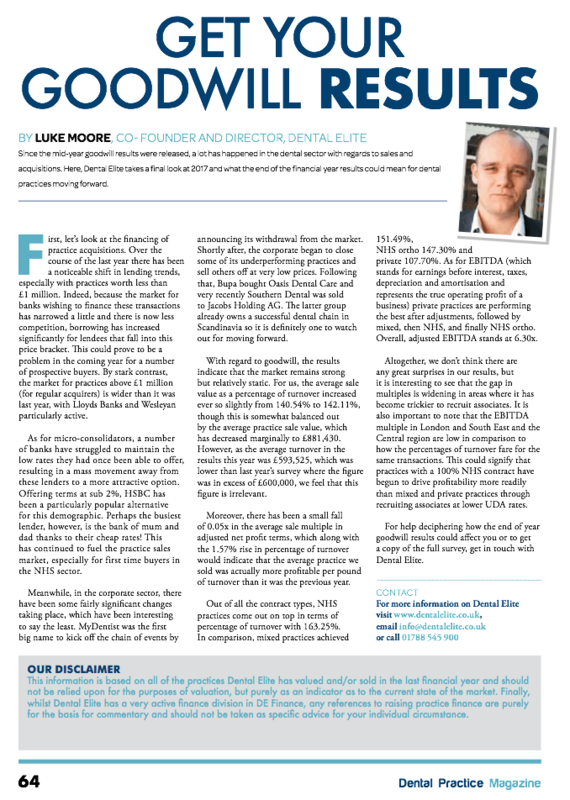 Moreover, there has been a small fall of 0.05x in the average sale multiple in adjusted net profit terms, which along with the 1.57 per cent rise in percentage of turnover would indicate that the average practice we sold was actually more profitable per pound of turnover than it was the previous year. Altogether, we don’t think there are any great surprises in our results, but it is interesting to see that the gap in multiples is widening in areas where it has become trickier to recruit associates. It is also important to note that the EBITDA multiple in London and South East and the Central region are low in comparison to how the percentages of turnover fare for the same transactions. This could signify that practices with a 100 per cent NHS contract have begun to drive profitability more readily than mixed and private practices through recruiting associates at lower UDA rates.